QPR scored twice in three first-half minutes as they came from behind to beat Sheffield Wednesday. Atdhe Nuhiu netted a low shot to put the visitors ahead on his debut. But Nedum Onuoha scored his first goal for the London club when he turned the ball home from inside the area, and Andrew Johnson volleyed in soon after. Wednesday's Jacques Maghoma had a penalty claim turned down after the break when Joey Barton appeared to trip him and later hit the post with a shot. 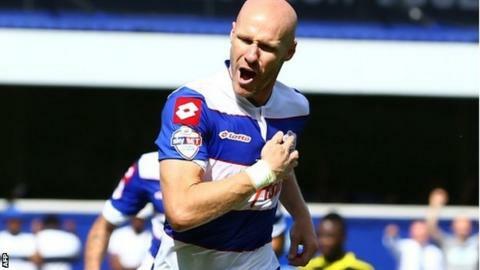 After relegation from the Premier League last season, QPR were given a reminder of just how frantic England's second tier can be in an exciting affair. There were six changes from QPR boss Harry Redknapp since his side's last Premier League game against Liverpool in May, with the likes of Loic Remy, Park Ji-sung and Stephane Mbia absent with their futures at the club uncertain. But perhaps the most surprising change was the inclusion of Barton, who had not played for the club since his red card against Manchester City on the final day of the 2011-12 season. The English midfielder, who spent last season on loan at Marseille, claimed there was an agreement for him to stay with the French club on a permanent basis and tweeted earlier this summer that "I will not be playing in the Championship next season". But no such deal has materialised and Barton was back in the blue and white hoops of the London side alongside new signing Karl Henry in the centre of midfield. Barton's display will have Redknapp thinking he could be a valuable asset in the Championship, despite some second-half drama. QPR's incisive play early on was finding gaps in Sheffield Wednesday's defence, with Johnson firing a deflected effort just wide before Owls goalkeeper Chris Kirkland saved from the ex-Fulham striker. But just when it looked like QPR would find a breakthrough, they were caught out at the other end as former Austria Under-21 frontman Nuhiu bustled clear before hitting a low effort past Rob Green in the home goal. Kirkland could do nothing to stop Onuoha getting his first goal for Rangers as the former Manchester City defender turned home Junior Hoilett's shot to level the game in the 40th minute. Dave Jones's Owls were caught out again three minutes later as Kirkland saved from Barton at the back post, but the ball broke to Johnson and he volleyed home. After impressing in the first half by creating a number of chances, Barton was booked after the break by referee Scott Mathieson for a late challenge on Jeremy Helan before he escaped a second - and a red card - moments later. Mathieson adjudged Maghoma to have dived in the area despite replays showing contact from Barton. Maghoma's misery was added to when he hit the post with a low strike before Charlie Austin made his debut for the hosts following his move from Burnley on Thursday, but the closest he came to opening his account was a header that flew over. "I thought we showed fantastic attitude and commitment to come from a goal down to get in front as we did. "They had chances and look a decent team. Dave's put a good team together this year. "But it was a great performance from us - we were first class." "It is fine lines and you want the big decisions to be the right ones. Unfortunately, it didn't go our way today and it is really disappointing. "It could have gone either way and we certainly deserved something from the game. "We've switched off for a crucial spell of the game and you can't do that."